We are offering Steel Needle Scalers and Chisel Scalers to our clients. 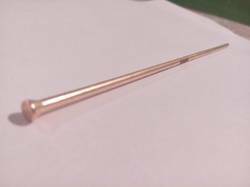 Available in different sizes (2mm, 3mm and 4mm) flat tip round form only, to be used in applications such as refurbishment of food processing machinery or areas of high humidity where the corrosive effect on needles would be prohobitive. Used on Decorative concrete surfaces where contamination of the surface from carbon steel needle is undesirable.